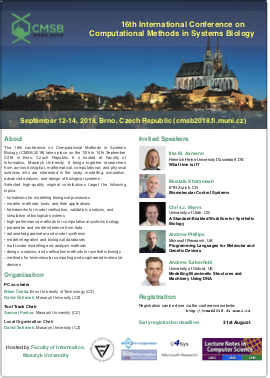 The 16th conference on Computational Methods in Systems Biology (CMSB 2018) takes place on the 12th to 14th September 2018 in Brno, Czech Republic. Its aim is to bring together researchers from across biological, mathematical, computational, and physical sciences who are interested in the study, modelling, simulation, advanced analysis, and design of biological systems. CMSB 2018 is hosted at Faculty of Informatics, Masaryk University, Brno. Brno is the city where the modern genetics has been founded. Join us for a visit to a famous place where Gregor Johann Mendel conducted his famous pea plant experiments. The proceedings of CMSB 2018 is published in the series Lecture Notes in Bioinformatics (LNCS/LNBI) by Springer. 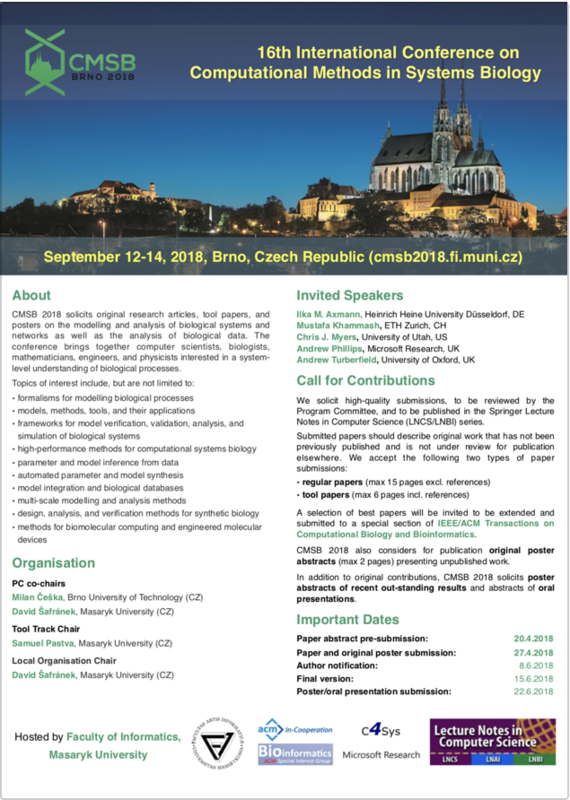 A selection of accepted papers will be invited to be extended and submitted to a special section of the journal IEEE/ACM Transactions on Computational Biology and Bioinformatics. CMSB 2018 is finished. It has been great pleasure for us to host and organise the conference. Photos from the event and slides of the invited talks will be added soon. We are happy to announce that the proceedings of CMSB 2018 are now published at Springer. Every registered participant will get a printed copy and online access for a limited time. Submission of flash posters and abstract presentations has been closed. We have received 25 submissions of these forms. Positive notifications have been sent to 19 papers out of 42 papers submitted (there are 15 full papers and 4 tool papers accepted). The acceptance rate is approximately 45%. The submission page is still opened for poster and presentation abstracts until 22nd June. In addition, we have accepted 3 original poster abstracts to be published in the proceedings (from 4 submissions). Submission of full papers and tool papers has been closed. The site is now open for submitting oral presentation abstracts or poster abstracts. We have received 47 pre-submission abstracts. Deadline for full and original poster contributions is extended to the 4th May. ACM In-cooperation support is now approved from SIGBio Special Interest Group. ACM members will have reduced registration fee. The interdisciplinary aspect of the conference is strongly emphasised by invited speakers covering several different areas where computational methods become highly relevant (modelling languages, computational systems biology, biological systems control, molecular programming, and biological physics). We are pleased to extend the set of invited speakers of CMSB 2018 with Ilka Maria Axmann. Dr. Axmann will give a talk on the modelling of cyanobacteria clock. Her talk will be supported by the National Infrastructure for Systems Biology (C4SYS). Second call for papers has been announced. Andrew Phillips is confirmed as an invited speaker. His talk will be supported by Microsoft Research. This year we solicit original research articles, tool papers, and posters contributions (For more info click here, important dates are here). Best papers will be invited (to be extended) to appear in a special section of the journal IEEE/ACM Transactions on Computational Biology and Bioinformatics. CMSB 2018 will be published in Springer LNCS/LNBI. Andrew Turberfield is now confirmed as an invited speaker. Chris J. Myers is now confirmed as an invited speaker. Mustafa Khammash is now confirmed as an invited speaker.